Kimi is a recent student at Bridge in the General English Program, at our center in downtown Denver, Colorado. We interviewed him to learn about his experiences with Bridge and what he plans to do with his improved English language skills. Kimi, can you tell us about yourself? Where are you from and what do you do? My name is Kimitake Yamada from Tokyo, Japan. I work in the photo sales department of a printing company in Japan. You can see my printers and systems at Walgreens. Why did you decide to study at BridgeEnglish in Denver? I decided to study ar Bridge because I want to communicate with my customers who are not in Japan more fluently. What do you like most about studying English at Bridge in Denver and what has been the best part of your course so far? I like to hear other students’ and teachers’ opinions. The best part of the course so far is discussions in the class. What is most difficult about studying English? The most difficult thing about studying here is telling my opinion in English completely. Are you staying with a host family or another kind of housing? I am staying with a host family. They are so kind to me, so I can stay in my house comfortably. Would you recommend Bridge to your friends? Of course. I hope that my friends have an amazing experience here at Bridge like me. What do you like to do when you are not in class? I like cooking. I want to learn recipes from other countries. I miss my friends, but I have many new friends here. What advice do you have for people considering studying English in the U.S.? What are your plans after you finish your program at Bridge? After I finish my program here, I may go to Taiwan and Korea on a business trip, and I will talk to my customers in English. 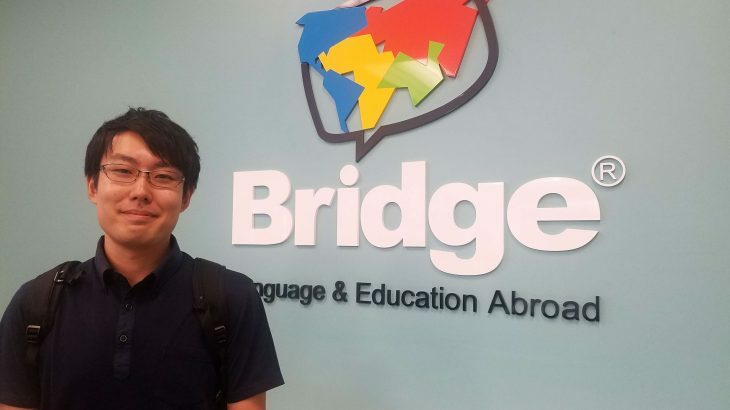 If you’re interested in studying English with BridgeEnglish like Kimi, check out this guide to help you determine what type of English classes you should take. BridgeEnglish in Denver, esl-blog, Meet our students!. permalink.